57" (145cm) Marseille style rubber weight belt for freediving and spearfishing offers a flexible belt that stays in place while diving. While on deeper dives as your waist compresses, this flexibility allows for a snug fit ensuring that the weight belt doesn't slip up across your chest. 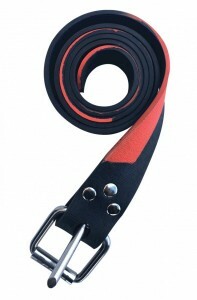 Heavy duty stainless steel roller buckle makes releasing the belt in case of an emergency a cinch. Click the button below to add the Riffe Marseilles Black-Orange Camo Weight Belt to your wish list.